This activity I created based on Montessori shapes I found free on internet. I laminated all pages of black and white shapes . Color set I laminated, cut out and I cut shapes in half. Then I attached some Scotch Fasteners and VOILA! Instead of using Scotch fasteners you can glue half of shapes to a laminated paper but I found Fastener works better for a baby as all these pieces are in one place. Like you see on a video Eaton is having a hard time to see a square when he sees 2 rectangles next to each other. We will be working more on that. I think it's a great beginning geometry activity. Thank you for sharing this one. I used cut out colored foams for this activity, and my 2 year old loves it. How did you introduce this activity. Did you first flash the shape names and the shapes as well? Thank you so much for sharing your activities. You son is brilliant! That's exactly what I did. I created big flashcards of montessori shapes and names when Eaton was 11 months old or even before. We also had few shape toys we were using and practicing names of shapes. 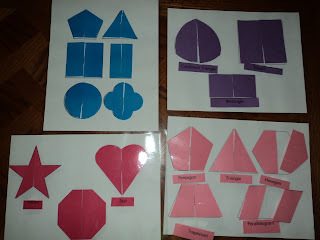 Other activity we had was a matching shapes game:I cut out shapes and matched them to the one on the paper I draw. But flashcards were the first. I always use flashards before introducing any new subject. In general: I used flashcards first, Continent song from youtube and then a map. Have a great day! Your parenting is quite inspirational. I tried Doman reading method with my son but became disillusioned...I felt it would take a lot of work. I was wondering how many flashcards did you show Eaton before he picked up reading English on his own. Also at what point were you able to show him smaller font? I'm not sure if I can answer the question how many flashcards did I show before Eaton picked up reading. I was showing him "your baby can read" flashcards; BrillKids printable flashcards, most of Doman encyclopedic cards and TONS of books. We were reading about 20 books a day: few pages with big fonts. But I think that the major influence on Eaton's ability or reading so quick was reading books with him and pointing to each word as I was reading. When I introduced smaller font? I think it was about 14 months, but I kept books with bigger fonts all the time. When time was passing I saw Eaton picking up books with little fonts. The best idea is to show the baby small fonts and see if he/she looks at words. Thank you so much, Marta. I absolutely love your blog and your dedication to parenting. I have started making doman cards and books for my toddler in large print. I plan on introducing phonics-jolly phonics-after a few months. YOu said some place that you have made 100 books...I'll be happy in I could at least get half as much done. Hopefully she picks up on reading as quickly as Eaton did.